In a previous blog we addressed the impact of omega-3 fatty acids and their mood-lifting properties, and now it looks like we can add certain B-vitamins to the list. A recent publication in the American Journal of Clinical Nutrition looked at whether dietary intakes of vitamin B-6, B-12 and folate had an association with depressive symptoms in a community-based population of adults aged 65 and older over a period of seven years (1). The study concluded that higher intakes of vitamin B-6 and B-12, but not folate, were associated with a decreased likelihood of depressive symptoms. This held true even after 12 years of follow-up. 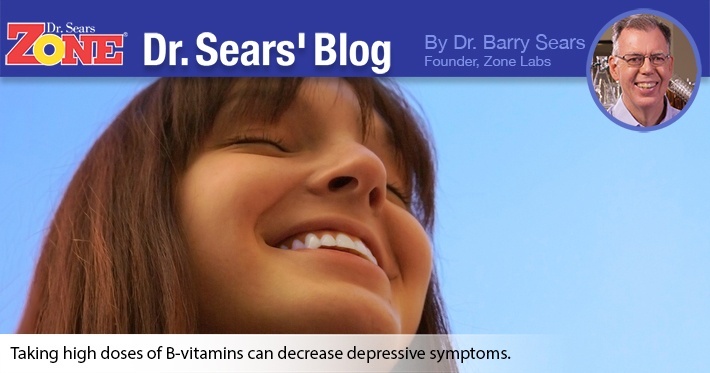 For every 10 micrograms of intake of B-6 and every 10 micrograms of B-12, there was a 2 percent decline in depressive symptoms per year. Besides their mood lifting properties, vitamin B-6 and vitamin B-12 have other important roles. Vitamin B-6 is a water-soluble vitamin that is involved in more than 100 enzymes needed for protein metabolism. It’s critical for red blood cell metabolism, and it plays a role in the nervous and immune system (2). Vitamin B-12 is also a water-soluble vitamin that is involved in red blood cell formation, neurological function and DNA synthesis (3). Now that you’ve read this article, it doesn’t mean go out and purchase mega doses of these vitamins. It’s not hard to consume either of these vitamins in your diet. Vitamin B-6 is found in a variety of foods from beans, meat, poultry, fish and some fruits and vegetables. Unlike B-6, the main dietary sources of vitamin B-12 include animal sources: fish, meat, poultry, eggs, milk, and milk products. B-12 is not found in plant foods unless they are fortified. Three ounces of clams supply approximately 34 micrograms of B-12, about 570 percent of the daily intake (3). If you feel like your intake of either of these vitamins is low, a multi-vitamin that supplies no more than 100 percent of the daily value should be sufficient. Skarupski KA, Tangney C, Li H, Ouyang B, Evans DA, Morris MC. Longitudinal association of vitamin B-6, folate, and vitamin B-12 with depressive symptoms among older adults over time. Am J Clin Nutr. 2010 Jun 2. Dietary Supplement Fact Sheet: B6. Available at: http://ods.od.nih.gov/factsheets/vitaminb6.asp. Accessed: July 2, 2010. Dietary Supplement Fact Sheet: B-12. Available at: http://ods.od.nih.gov/factsheets/vitaminb12.asp. Accessed: July 2, 2010.